Chia seeds are one of the world’s oldest sources of nutrition, documented to have been eaten by the ancient Aztecs and Mayans as early as 3500 BC. Derived from the desert plant Salvia hispanica, chia seeds offer the highest combined plant source of omega-3, fibre and protein, alongside a range of vitamins, minerals and antioxidants. Chia offers essential wholefood nutrition that is often lacking in the modern diet. 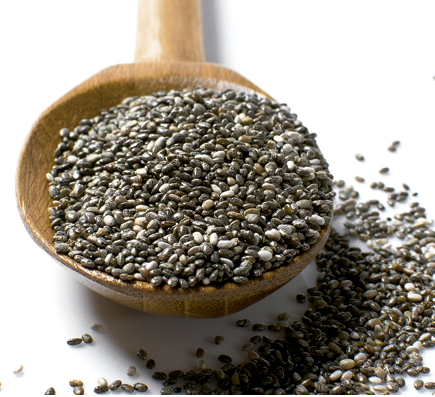 Adding a tablespoon of chia to your daily diet delivers 3g of omega-3 ALA and 6g of dietary fibre. Chia also a fantastic source of vegetarian protein, containing all nine essential amino acids. Chia seeds can be either black or white, but never brown. There is no nutritional difference between black and white chia, however brown chia is immature and should not be eaten. Lets take a closer look at why Chia should be on the menu everyday. Chia is the richest plant source of Omega 3 essential fatty acid. Fats make up to 60% of our brains and insulate nerve cells to provide communication between the cells. Omega-3 oils reduce inflammation in the blood vessels and cells of our brain, helping to promote good blood flow and increase positive mood. Omega 3 also helps improve hormonal imbalances, so be sure to eat fresh fish at least twice a week and plant sources of Omega 3, like Chia, every day. Chia is beneficial in the area of digestion because of the rich fiber content. Chia has 37% fiber – 20% is soluble and 80% insoluble and both are extremely important in maintaining regular gut function and good gut health. Many people compare Chia and Flax and are happy to learn that Chia has twice the fiber of flaxseeds. Chia holds 16 times its weight in water and swells to form a thick gel when mixed with liquids. 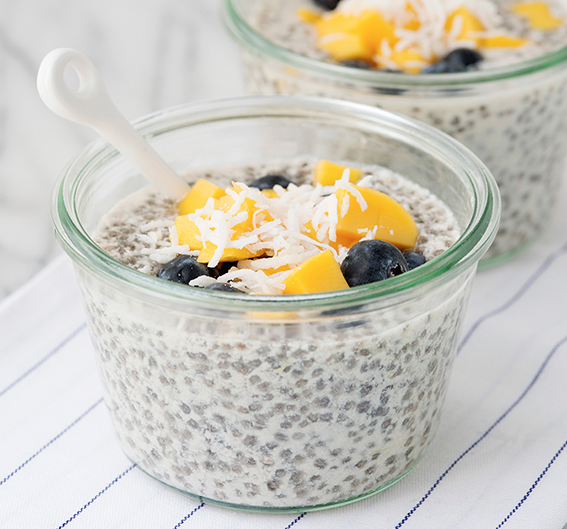 The rich fiber content in chia slows the conversion of carbohydrate to sugar and provides a slow release of energy, stabilizing your blood sugars, reducing cravings and helping to keep you full. Chia is the only gluten free wholegrain that can be eaten raw, directly from the packet, without grinding or cooking. Chia is predominantly known as an oil seed, but it is also a wholegrain food. People managing gluten free diets often struggle to find sources of wholegrain nutrition and Chia is an excellent source. Chia is rich in vegan protein (20%) and with all 8 amino acids chia is a complete protein. Our body uses protein to build and repair tissue, synthesize and regulate hormones and is the building block of bones, cartilage, muscles, skin and blood. Protein is required to function every cell in our body and because it is not stored in the body we need to eat it every day. Chia is a fabulous source of vegan protein and is easy to include in the daily diet. Pour the almond milk into a 1-quart mason jar, or a jar with a tight fitting lid. Add honey and orange zest. Screw on the lid and shake well. Keep in the fridge until very thick and pudding like, preferably overnight. Add fruit and shredded coconut before serving. Chia pudding, that’s a lot of sugar. I would add none as there is plenty of sweetness in the fruit alone. Sugar causes inflammation, no?